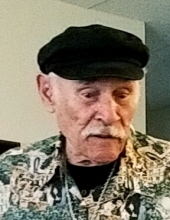 Tomas Nieves-Cruz, age 86, died on March 29, 2019 at his home in Woodbury where he lived for 14 years. Tomas formerly lived in Camden. He was a cook for many restaurants including The Pub, Hideaway, Park Crest and many other restaurants. He was predeceased by his wife Shirley Ann Houser, sons Thomas Nieves, Rafael Nieves, Michael Nieves Sr, and daughter Maria Nieves. Tomas is survived by his fiance Mary E. Williams, children Robert (Deborah) Bruni, Viola M. (Kevin) Goodwin, Thomas C. (Courtney) Nieves Jr., siblings Celia, Francisco, Iris. Lucy, Louis, Carmen, Delia, Hector, Eusebio, Confessor Jr, Enrique, Magali, grandchildren Karen Smith, Stacey Moore, Robert Bruni Jr., Christopher Bruni, Kyle Goodwin, Kristin Goodwin, Keith Powell, Brooke Jeter, Desiree Nieves, Chastity Velez, Felicia Nichols, Joseph Nieves, Michael Nieves, Delilah Nieves, many great grandchildren, great great granschildren and many nieces and nephews. Tomas was also predeceased by seven siblings and two nephews. Friends may greet the family after 10am on Thursday, April 11, 2019 in the reception room of the Colonial Park Apartments, 401 S Evergreen Ave, Woodbury, NJ 08096. Memorial Service will be at 11am. A luncheon will be held immediately following at his son Robert Bruni’s residence, 894 Little Mill Rd, Franklinville, NJ. 08322. All are welcome to bring and share your favorite dish. In lieu of flowers, contributions may be made to the American Cancer Society at www.cancer.org. To send flowers or a remembrance gift to the family of Tomas Nieves-Cruz, please visit our Tribute Store. "Email Address" would like to share the life celebration of Tomas Nieves-Cruz. Click on the "link" to go to share a favorite memory or leave a condolence message for the family.